Model rocketry can be fun and educational, but launching these devices can also cause fires that can place lives and property at risk. 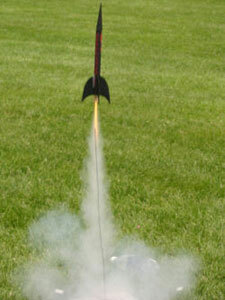 As a result, anyone wishing to launch model rockets is required to apply for a permit and meet specific requirements. Model rockets are not allowed to be launched anywhere within the City of Escondido except for designated areas at Jesmond Dene Park. Rockets may be launched only between 8:30 a.m. and 11:00 a.m., Monday through Friday or Sundays. No launching is allowed on Saturdays. A permit must be obtained before any rocket can be launched. There is no charge for a model rocket permit. Launching permits are not granted between June 1 and October 31 due to the high fire hazard. Final approval must be obtained by telephone on the day of the launch. Only “A” and “B” model rocket engines are allowed. Launching must be supervised by an adult. State law requires that the permit applicant be at least 18 years of age and be responsible for all persons using the permit under his/her direction. The applicant must be familiar with the NAR Model Rocket Safety Code at the time of application. A copy of the Safety Code can also be obtained along with the permit application. In order to obtain a permit, the applicant must go to Escondido City Hall, 201 N. Broadway. Application forms are available by request at the Community Services Department counter on the first floor. After the form is completed and turned in, the applicant will be notified if the application is approved and the permit ready for pick up at City Hall. For more information, call the Community Services Department at 760-839-4691.